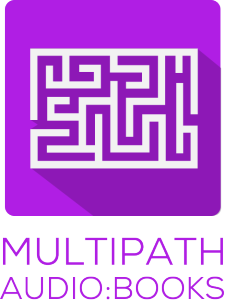 Each Multi Path Audio book is a multiple choice ‘book on tape’ with many different paths to take, endings, titles to earn, and ways to lose! 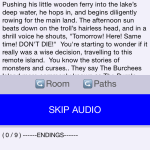 The stories can be played on the iPhone or iPad using touch or voice recognition. At it’s core it is an entertaining audio-book and a hands-free time killer for those long trips in the car, plane, or bedtime. The fun part is that you can play each audio book again and again, trying out different paths. You don’t have to finish each game in one sitting, it will remember where you left off last. 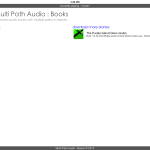 The way Multi Path Audio works is just like listening to a regular audio-book, except that you will have the ability to make a selection based on which way you would like to go. You can make this selection by either, speaking or touching the screen. Many more books in this series will be released over time, and there will be many other different genres of books to come, as well as other contributing authors! As stories are released they will show up in the app. 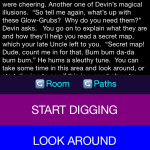 Play all of the stories through three times for free! Then if you like the story you can purchase unlimited replays. 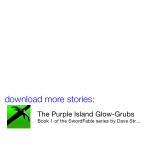 The first story is titled The Purple Island Glow-Grubs written by Dave Strand and Kelly Levy with narration by Peter Hicks. It contains over 2.5 hours of audio, with 9 ways to win and 21 ways to lose! Each story line takes roughly 10-20 minutes. 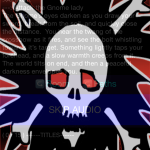 Each Multi Path Audio book is an interactive multiple choice audio story with many different endings, titles to earn, and ways to lose. The fun part is that you can play each book again and again, trying out different paths. You don’t have to finish each game in one sitting, it will remember where you left off last. The way Multi Path Audio works is just like listening to a regular audio-book, except that you will have the ability to make a selection based on which way you would like to go. You can make this selection by either speaking, or tapping the screen. Many more books in each series will be released over time, as well as different types of stories by various authors. Before we begin, let’s go over a few technical notes. In the Settings menu at the top of your screen you will find some ways to customize your experience. You can select different color schemes, or whether the voice recognition software should repeat back what it thinks you said for clarification. There are also three Microphone Settings to choose from in the Settings menu. Mic ON, Mic OFF, and Push to talk Mic. We suggest you adjust these settings now. If you don’t want to use the voice commands, and prefer to use the touch screen, we suggest you Select Mic OFF. If you are in a quiet room, and would like to use voice commands we suggest you Select Mic ON. Or if you are a noisy environment like a car, please select Push to talk Mic. With the push to talk option enabled a large button will appear when it is time to speak. Press and hold the button while you record your voice command. When you are finished talking, remove your finger from the button. If you minimize the story, press the pause button, or remove your headphones the game will automatically Pause and Save. We also have a new feature which allows you to Pause or Unpause by shaking your device. And one last note. For safety reasons please remain alert and aware of your surroundings while playing. Alright, now let’s get started! 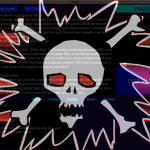 If you would like to report a bug, suggest an improvement, or are an author that would like to write for MPA:B you can contact us here at Hobjoblin! here is a link to known bugs we are working on and proposed improvements to the app for the future!